Optical Coherence Tomography uses a low energy laser beam to image the retina creating a high resolution cross section of the retina. 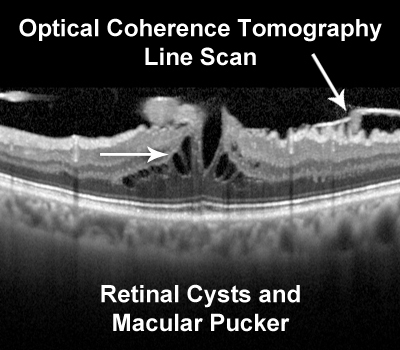 Optical coherence tomography uses a laser light to sweep the retina and produce a high resolution image of the retina. The device has revolutionized the care of retina patients. With OCT it is possible to detect small amounts of subretinal or intraretinal fluid and to evaluate treatment reponse. Since it is non-invasive and uses only a light beam it is very very safe. The light used is in the infra-red range and therefore is well tolerated because the human eye does not see intfrared. It can also be performed through an undilated pupil. The cross-sectional images OCT provides of the retina are analogous to histology slices, but in living tissue. These images, sometimes likened to a "virtual biopsy," are obtained in a noninvasive, noncontact office-based imaging procedure that has rapidly become an integral part of standard ophthalmic practice. What is a Line Scan? Individual high resolution line scans are a simple way to identify overt as well as very subtle retinal interface pathologies, such as a persistently adherent posterior hyaloid, fine epiretinal membranes, and vitreomacular traction. 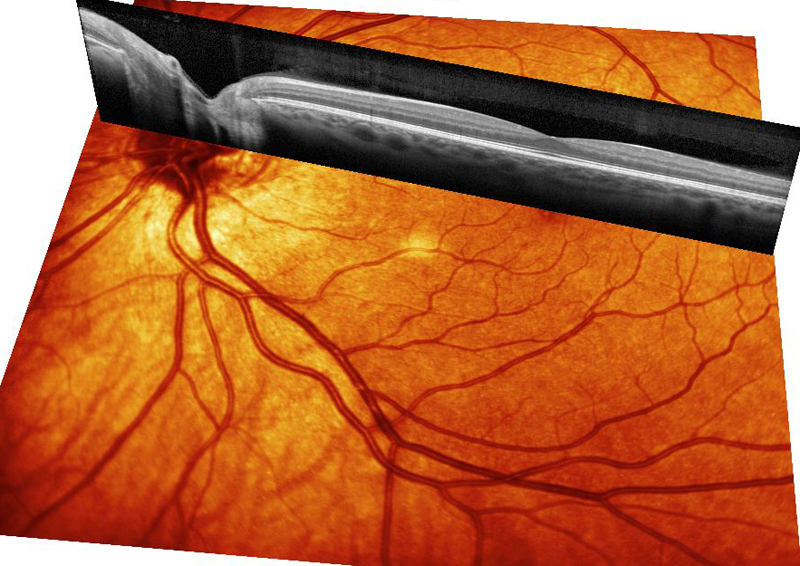 The OCT machine uses the retinal vessels as landmarks and is able to image the same line 100 times. It then averages the images to create a very high definition scan. In a procedure that is easily tolerated by most patients, well-placed line scans can differentiate between pseudo holes, lamellar holes and full thickness macular holes with a high degree of confidence. Line scans show detailed macular anatomy and are useful for diagnosis of retinal diseases and for monitoring treatment response. 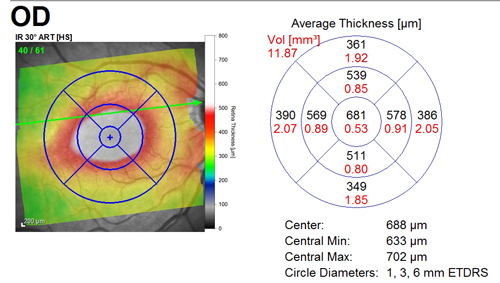 The OCT machine can combine multiple line scans to create a contour map of the macula. The map is useful for following macular edema. The central foveal thickness is used to assess the disease status and response to treatment. The colors on the map are related to retinal thickness. Red on a map does NOT indicate blood. The thickness scale goes from blue through red to white. Blue is thin and red is thick. 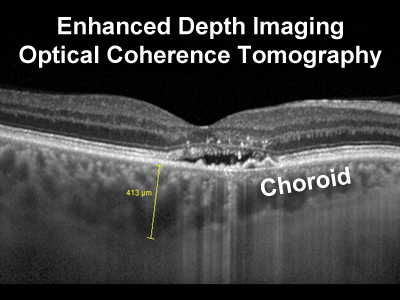 What is Enhanced depth imaging (EDI)? Enhanced depth imaging (EDI) OCT technique, allows visualization of the deeper structures of the eye such as the choroid and underlying sclera. EDI OCT is helpful in evaluating patients with choroidal diseases like choroidal nevus, central serous retinopathy, polypoidal choroidal vasculopathy, and high myopia. It is performed with the standard OCT machine using slighly different settings so the image is focussed deeper in the eye.